What's wrong with his swing? | Paciorek's Principle of Perfect Practice - Simplicity! The three major components in effecting the proper technique for batting a baseball are these: balance, vision, and power. As the pitcher throws the ball, the batter’s strong balanced position allows his eyes to focus on the point where the ball is being released. Preliminary movement implies that his body is “gathering” itself to brace for any number of possible conditions. The body maintains a low center of gravity to ensure stability, while shifting its weight slightly inward (not back) to initiate a quick twisting response to the ball as it presumably enters the “zone.” The quick twisting response is generated by a rapid sequence of fluid rotary movements simultaneously by the entire turning body, beneath the stationary head. If balance and focus are maintained from start to finish, the power and effectiveness will be evident in the beauty of the “follow-through.” A batter establishes stability and balance to perform his task when his center of gravity is low. His ability to see the ball most clearly is determined by the extent to which his eyes are on a parallel level to the ball, and the degree to which the body and head maintain a stable vehicle for proper focus. Power is generated most effectively with the body in a stable, balanced position, from which all movements can be produced most speedily, and with a minimum strain to accompanying body parts. The centripetal force provided by the stable position of the vertical axis produces the powerful centrifugal force, which magnifies the power elicited by the turning hips and shoulders. At his season’s end Josh Hamilton gave no evidence of balance, visual discernment, nor power in his application of batting technique. His high stance, with knees only slightly bent, and hands and bat held high on his shoulders, afforded him little balance because, as the pitch was thrown, his body swayed over the plate as it was striding toward the pitcher. His hands lowered the bat from parallel to perpendicular to the ground as his front leg reached forward to try to time the pitched ball and plant the foot to initiate the turn of his body. His body would almost always respond too quickly with the turning hips, and the suspended front foot would land abruptly to the right of his intended stride. His upper body was moving toward the plate while his lower body was falling away. Any pitch at the middle of the plate to the outside corner and beyond had him lunging and missing almost every low and away pitch. And every inside strike appeared to him to be “inside” and unhittable to his “tied-up” position. Because of his inherent off-balanced position, he hardly ever demonstrated his innately prodigious power because the “vertical axis” of his body was never intact. He did manage a few home runs of lesser-grade because of his natural, raw power. His visual acuity was so poor that most observers could see him starting his swing at a hard slider before he could detect that it was not a fastball. And of course, he’d miss the pitch completely and usually strike out. The end result of his poor mechanics was a swing of the bat that most often took the appearance being nearly perpendicular to the ground. With a bat that approached the ball at that angle all the time it’s no wonder that his base hits were either weak flairs skidding off toward left-field, or hooking bouncing balls from rolling wrists as they sneaked through the right side of the infield. To hit the ball consistently with authority, the batter must be able to be in a position to view the pitch on a line as directly parallel to the eyes as is physically possible. Why? And are you sure? What is the basis of such a thought? To answer that question requires only an illustration for anyone to presently apply, or recollect from previous experience. If Roger Clemens (or Randy Johnson) is standing on the pitching mound, and you are the catcher (without any catching-gear, except a mitt), standing erect behind home-plate, and he throws his fast-ball (100 MPH) at your knees, would you be able to catch that pitch while in your present, high stance? If you have no prior experience that can relate to this situation, you may not be able to appreciate the implications proposed by the question. If you have experienced something of this nature, even with a thrower of inferior ability to Roger or Randy, you would immediately know that you would want no part in that prescribed adventure. A professional catcher, in a catcher’s crouch, seeing the ball at eye-level, has a difficult time catching a Roger Clemens knee high fastball! A non-professional, or a rank amateur, attempting to duplicate such a feat while standing erect, would probably be subsequently admitted to the Mayo clinic for knee replacement surgery. A batter who thinks that his “tall” stance makes him more formidable doesn’t realize how difficult it is to hit a low pitch. If he does hit it occasionally, he can attribute that slight success to luck and guesswork. Bend the knees to a strong, well-balanced but comfortable position, with the upper body leaning slightly toward the plate. Take no stride. When ball is in striking position, simply push down on front foot while the bent back knee begins the action of the hips. The front-foot plant begins the straightening of its leg to keep the body from lunging forward as the back hip initiates the driving force to power the shoulders, arms, and hands with the bat into the ball. Since no stride is necessary, the head and eyes are able to stay still and focus on the flight of the ball as the swing is commencing until its completion. With the front foot slightly point (45 degrees), the swing will not be disrupted by the imminent sense of ankle or knee displacement as the body is turning to deliver its maximum force. The hands should be no higher than the highest strike, to eliminate the temptation to swing at any pitch above the strike-zone. From that position it is easier to adjust in a singular direction to attack any pitch lower than the high-strike. The ideal “bat-plane” is on a pitch right down the middle, for the best of swings will facilitate its action to appear almost parallel to the ground until contact, and slightly after, then a gradual ascent upward and around the shoulder. 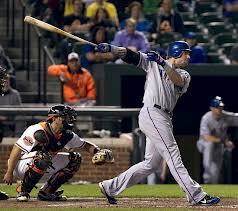 A slight angle will be negotiated by the body’s shoulder-tilt as the batter swings effectively at lower pitches. (But not like Hamilton’s swing, whose bat is close to perpendicular to the ground.) A low stance will preclude the need to widen the bat angle for low strikes. A player can have the strongest body and the greatest looking swing and never be totally effective if he does not demonstrate Balance, Visual Acuity, and Power. Josh Hamilton’s lack of balance limits his visual acuity for following and discerning accurately a pitched ball, and prevents him from utilizing his prodigious power. The preceding dissertation is a means by which he may begin thinking about a practical change in batting strategy and attempt to counteract the flaws that prevent him from attaining his own maximum effort. Visual stability and acuity as well as the rapid deployment capability and self-contained power source of a low, fixed stance provide a practical two-fold principle to establish the highest possible potential for the least margin of error in consideration for diminishing Baseball’s batting deficiency quotient. This principle will not be found lacking for want of a legitimate basis of confidence. The rules are simple and orderly. To abide by them and commit them to proper interpretation are what seem to be difficult, especially to those who prefer to act on their own fallible human instincts instead of a sound basic principle. A prominent 19th century philosopher makes this statement for our consideration, “The higher false knowledge builds on the basis of evidence obtained from the physical senses, the more confusion ensues and the more certain is the downfall of its structure”. Therefore, make it SIMPLE — by letting Principle speak for itself! The scientifically minded “artist-of-the-bat” should understand and adhere strictly to the rules of his mental-physical application, and rest his performance on this sure foundation. He should hold his thought perpetually to the idea that his natural talent and indisputable scientific certainty can and will evoke from Principle the rule for mastering the most difficult task in all of sports. There was no better athlete in the game over the last two decades than Alex Rodriguez. He hit home runs with greater ease than any other player in the game (except Barry Bonds). But why is it that opposing managers and pitchers hardly ever gave him an intentional pass, even in critical game – situations? It’s probably because they felt (or knew) that if they didn’t make a mistake they’d be more likely to get him out than they would Barry Bonds. A-Rod does one thing that Barry did not do, and this creates a “margin –for-error” that prevents him from being an even better hitter. Barry’s front foot hardly lifted off the ground, and moved only slightly forward while keeping his head and eyes perfectly still in his low center of gravity. Barry had little difficulty in planting his front foot properly when it was time to attack the ball with the synergistic forces of the legs, hips, shoulders, arms, and hands. Very seldom could a pitcher catch him off balance enough to disintegrate his swing. A-Rod is different. His stance begins balanced, low, and stable. But as the pitcher releases the ball, A-Rod starts an obtrusive attack with what I’m sure he thinks is a precision “timing mechanism” to incorporate a power surge. In fact, it does nothing less than unwittingly denigrate what is intended to initiate a “masterful stroke”. He lifts his front foot high off the ground while he waits in “suspended animation” to detect the speed, direction, and nuances being delivered by the pitch before he abruptly lunges forward and down to plant the foot to begin the swing. If the plant is too early, he’s out in front of the pitch and loses much of his power. If he is late with the plant, the fast ball is by him. It is not uncommon to witness the devastating effect of the “later” situation in the form of a called third strike when the ball speeds by him and his foot hasn’t yet planted. In the “former” situation, the effect of being too far out in front is usually not so devastating because his uncommon strength in the shoulders, arms, and hands affords him enough “hang-time” to at least make contact and string out a base hit or better. The point of this article is to concede that A-Rod is a tremendously hard working baseball player. Everyone who knows of him presumes he is trying to be the best that he can be. His workout ethic seems to imply that he would be a “perfectionist” (even with all the steroid accusations). Now, even as an elder statesman, and if he can overcome his current “morality and ethical issues”, he can still be a productive ball-player if he can extricate himself from thinking he needs his “high leg-kick”. Josh Hamilton and Matt Kemp are two of Major League Baseball’s brightest stars. Yet both have technical flaws in their swings that prevent them from establishing a consistent flow of mechanical precision. Whenever I watch an Angels game, the best Josh seems to be able to do is “slice” a mediocre base-hit to Left, or flick a “roll-over” bouncing ball through the right side of the infield. There is a reason for such “imperfect” deployment of superior physical skills. When Matt Kemp is healthy enough to play, most often he hits pitched balls either with “top-spin” that sneak through the infield or looping line-drives for base-hits (and sometime home runs), or hits towering fly-balls to the deepest parts of the Out-field. There is a reason for his obvious misappropriation of prodigious power. Josh needs to change his thinking about effective batsmanship and revamp his stance and approach to the ball, while Matt has only to change the position of arms and bat within his current stance. A full elaboration on procedures to correct the mechanics of both players will be forthcoming. 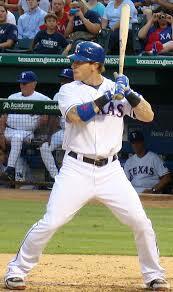 Has Josh Hamilton’s swing changed since his monster years with Texas? What accounts for his great success then and his problems today? I never had much of a chance to watch him in his MVP year, and didn’t start watching him closely until he started slumping during the second half of last season. I couldn’t believe that anyone who had put up such good numbers in that first half could look so horrible from then on. The only thing that was quite obvious was that he was considerably off-balance during and after his swing. This season I was able to watch him a lot with the Angels, and he still was always off-balance. As I described in detail what he is doing now, I can’t see him doing those things in the past and being successful. Even in those 2 photos in my article, as a Ranger, he seemed to have much more balance in his stance and follow-through. I’ll have to find some video of his MVP year and beginning of 2012. John P.
Anyone who thinks ‘getting the foot down on time’….as a cause….instead of an ‘effect’ is seriously missing the key ingredient(s) of the high level swing. “Seriously”? Try swinging a bat with your front-foot up! Thank you.